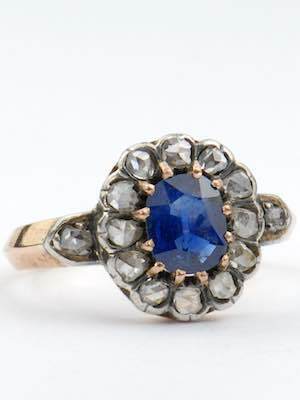 Diamonds spin around this Victorian engagement ring's blue sapphire like the ticking hands of an antique clock. 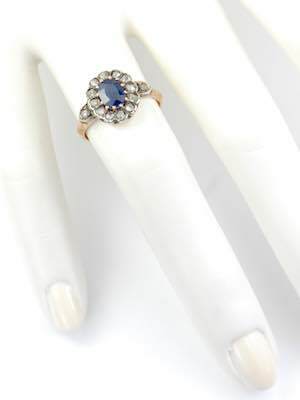 Each time she looks at this antique engagement ring, she'll be reminded of your enduring love. 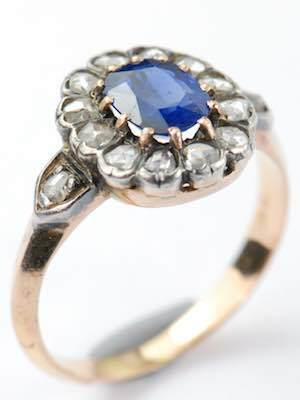 Twelve rose cut diamonds encircle the blue sapphire in this engagement ring, ticking off minute by minute, hour by hour, the passage of time. Two additional diamonds highlight the shoulders of the 18k rose gold band. Details: Antique, Victorian. Circa 1875. 18k rose gold. Rose cut diamonds; 0.24 carats. 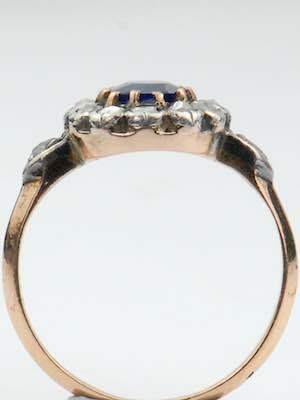 Cushion cut sapphire; 0.76 carats. 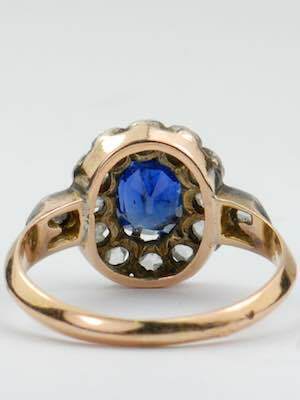 Special characteristics This hand wrought classic sapphire and rose cut diamond ring is circa 1875. Twelve rose cut diamonds are pinch set in a scalloped silver trim. The shoulders contain two additional rose cut diamonds which are bead set in silver plates.